On March 10, 2019, I was installed as the 28th settled minister of FCU since its founding in 1714. It was an incredible and joyful day! There is a video here if you’d like to see for yourself. The Rev. John Gibbons preached (“Getting the Hell out of Paradise”), and there were other wonderful speakers and lovely musical performances as well. There are so many people to thank… you will see them named at the end of the video. 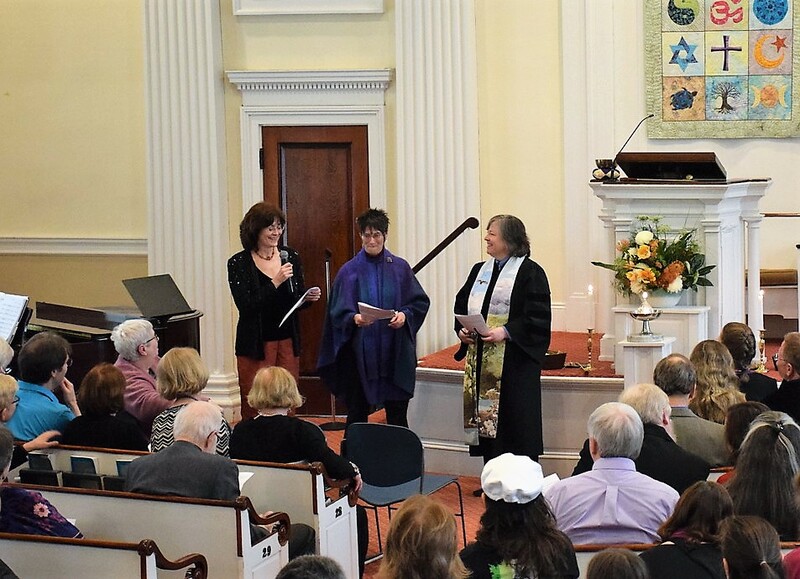 The photo to the left is of the Act of Installation, the heart of the service, when the congregation and I shared our covenant. Leading the way were our Standing Committee Co-Chairs, Alison Bentley and Lezli Whitehouse. It was one of my favorite moments in the service. I feel so lucky and grateful to be sharing ministry with the wonderful people of First Church Unitarian in Littleton. I will never forget the day… I hope that this shared ministry lasts for many, many years to come. Below are some more photos from the day, with captions. The Church Choir performed twice, and beautifully. The Artemis Singers performed a lovely offertory piece. The Rev. John Gibbons preaching a thought-provoking sermon with surprises. The UU Ukes delighted us and made us smile, as they always do! The Laying on of Hands, detail.